There has not been much movement of late on the Israeli-Palestinian front. This may partly be explained by the relative lack of violent activity by Palestinian groups. The conflict has dropped off the radar for most of the Israeli public, and the only constituency the government needs to worry about is that of the far-right pro-settler parties which hold the balance of power and effectively wield a veto over any potential moves towards territorial concessions. In other words, the political calculus of the Israeli government currently favours doing nothing on Palestine. By contrast, if Palestinians were to reintroduce violent tactics in a major way, the conflict would certainly return to the forefront of Israelis’ minds. However, the political mood would not be one of peaceful accommodation, but one of revenge and bloodlust — especially if militants were to target civilians as they have in the past. And that doesn’t even touch on the obvious moral considerations. So how do Palestinians move forward with their legitimate aim of self-determination given the apparent damned-if-you-do-damned-if-you-don’t circumstances in which they find themselves? I have a humble suggestion. In addition to diverse methods of non-violent resistance and civil disobedience (which some research shows to be more effective than violence), I would like to see them employ a strategy of asserting their sovereignty not just in the UN, but in Palestine itself. They could establish a security force that is unified, disciplined, and democratically accountable — one that is operated and supported by the long sought-after Fatah-Hamas unity government. 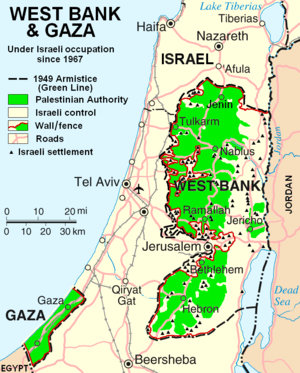 Ideally on the heels of an official UN recognition of the state of Palestine (but not necessarily, in case this bid fails), the security force could announce its sovereign authority over all the West Bank, Gaza Strip, and East Jerusalem — including all Jewish settlements, Israeli military installations, and coastal waters off of Gaza. And once they are prepared to escalate from talk to action, carefully choosing the appropriate target at the appropriate time so as to minimize the chance of bloodshed, the security force could move in and attempt to arrest any soldiers or settlers who are found to violate laws passed by legitimate Palestinian institutions. They would almost certainly fail in carrying out these arrests given the obvious imbalance of power. But just the attempt, in all its rich symbolism, and the professionalism with which it is undertaken, could generate publicity and awareness, demonstrate how serious Palestinians are about their lengthy quest for self-rule, and win over converts to the cause in Israel and around the world. If it is intelligently executed, their negotiating position in peace talks could strengthen dramatically. I am not aware of the Palestinians ever having used a tactic like this before (if any readers have information to the contrary, please do let me know). It does not automatically solve every problem, nor does it even begin to tackle the crucially important refugee issue. But Palestinians living in the Occupied Territories have been seeking freedom for decades, with remarkably little to show for their struggle. Their political and humanitarian plight is in desperate need of attention. The tactic I recommend is at least worth a try. This entry was posted in Middle East, Peace and tagged Fatah, Gaza, Hamas, Israel, Israeli-Palestinian conflict, Jerusalem, Palestine, West Bank by David Taub Bancroft. Bookmark the permalink.